SugimotoWorks is Satomi Sugimoto's online portfolio. 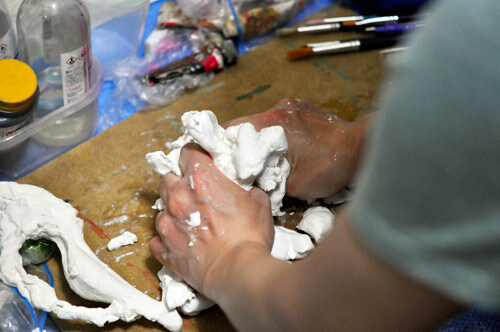 She is a Japanese woman who loves creating art. Satomi Sugimoto was born in Fukuoka, Japan and lives and works in Tokyo. She studied fine art at National Academy of Design School of Fine Art, New York, USA. She received her BFA from School of Visual Arts, New York. I have always been attracted to forms and lines since I was a child. Everything in the world has those fundamental elements and I see the undeniable beauty through them, regardless of whether it's natural or artificial. I feel my art-making is a spiritual process; a search for the essence of objects and a process of purification where a single element is explored, honed and expressed, using a rich range of humble materials such as paint, ink, enamel, plastic and clay, or whatever material best expresses the idea I seek out. I combine my sculptures with very sensitive use of painting to express the richness and complexity of natural forms. I see motifs of life reflected in my work including organic forms, elemental forces, body parts of humans, insects and animals. In the process of art-making, I lose my sense of self and turn into a receptacle/cipher that borrows and expresses the beauty of the world. These are the moments when I realize that I am also one of those simple objects existing in this universe, which also allows me to be not just the observer, but also a part of what's being observed. That is how I connect myself with the world and it keeps me creating my work.